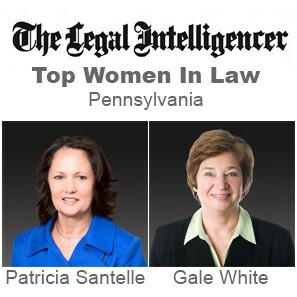 Managing Partner Patti Santelle and Partner Gale White were among the 25 women recognized by The Legal Intelligencer as "Top Women In Law" for 2016. The honor shines a light on the outstanding work being done by female attorneys across Pennsylvania who are making strides to push the legal profession forward for women. Honorees were selected by The Legal, with the help of suggestions from the legal community. Patti Santelle, Managing Partner of the firm since 2013, is recognized by her clients and peers as a leading attorney in the field of complex insurance coverage. She has devoted more than 25 years to the representation of insurance company clients in matters involving asbestos, environmental, toxic tort and long-tail claims. Gale White serves as Chair of the Insurance Coverage and Bad Faith Group and Co-Chair of the Bad Faith and Extra-Contractual Liability Group. She represents major property and casualty insurers and smaller regional insurance companies on a national and regional basis and has a broad range of experience in complex litigation, including commercial litigation, insurance litigation, coverage and bad faith.